The aorta is the largest artery in the body. The abdominal part of the aorta is located below the diaphragm. It carries blood to the abdomen, pelvis, and legs. Sometimes, the walls of the aorta weaken and bulge in one area. 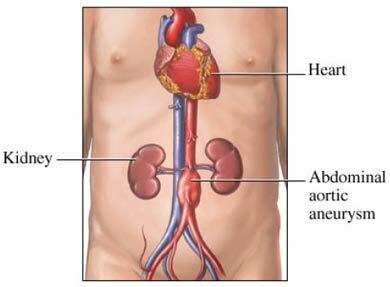 This is called an abdominal aortic aneurysm (AAA). When the aneurysm reaches a certain size, it may need to be repaired. Endovascular repair of an AAA (EVAR) is done from the inside of the artery. A stent graft is inserted into the area to strengthen it. EVAR is now the preferred method to treat AAA. EVAR can result in less pain, shorter hospital stay, fewer complications, and faster recovery time compared to open surgery. However, closer follow-up over many years is needed. Do not eat or drink for 8 hours prior to the procedure. You will lie on your back. Small incisions will be made in both sides of the groin. Thin tubes called catheters will be inserted into the blood vessels and threaded up toward the aneurysm. Contrast dye will be injected through the catheters. A stent graft will be guided to the site. The graft will be placed into the weakened area and extended into both pelvic arteries. X-ray images will be used to guide each step. Once the graft is in place, the catheters will be removed. The incisions will be closed. Sterile bandages will be applied. You will be taken to the intensive care unit (ICU). If you have a breathing tube, it will be removed. Your vital signs will be closely monitored. Anesthesia will prevent pain during the procedure. Your doctor will give you medication to manage the pain during the recovery process. There is little discomfort from the groin incisions. The usual length of stay is 1-2 days. Your doctor may choose to keep you longer if needed. Endovascular repair of abdominal aortic aneurysms. Society for Vascular Surgery website. Available at: https://vascular.org/patient-resources/vascular-treatments/endovascular-repair-abdominal-aortic-aneurysms. Accessed March 1, 2018. Endovascular repair of thoracic aortic aneurysms. Cleveland Clinic website. Available at: https://my.clevelandclinic.org/health/treatments/16962-endovascular-repair-of-thoracic-aortic-aneurysms. Updated September 2016. Accessed March 1, 2018. Fotis T, Mitsos A, Perdikides T, et al. Regional Anesthesia versus general anesthesia in endovascular aneurism repair: the surgical nursing interventions. British Journal of Anesthetic and Recovery Nursing. 2009;10(1):11-14.